You can build with ease Tutorial Websites, Video and Picture packs selling sites or Music selling website in just few clicks. The built-in player will allow just users that have bought the media to watch/listen - the webmaster can set up a limited or unlimited number of views. To use all the features provided by Media Mall you will need an account, click on Create an account and enter the account details such as the username, name, password and a valid email address. Going to My Profile page you can purchase credits, edit your profile and author details, manage your balance and more. To get most of the media files you will need credits, click on Purchase credits to buy some. 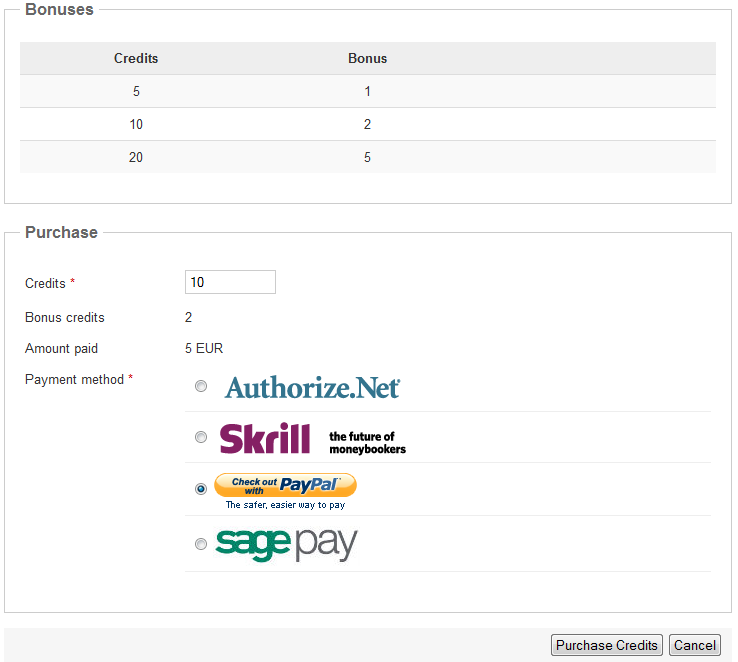 Enter the amount of Credits you wish to purchase and select one of the payment gateways enabled by the administrator. Credit bonuses can be set by the administrator so that when a purchase equals or exceeds a defined value you will get an extra amount of credits. Confirm the purchase with the selected gateway. After the payment was processed by the gateway you will see it on the Credits History section. By clicking on Edit profile you can add more details related to you and also change some settings. You can modify how you wish to be identified when writing reviews, by username or by name. 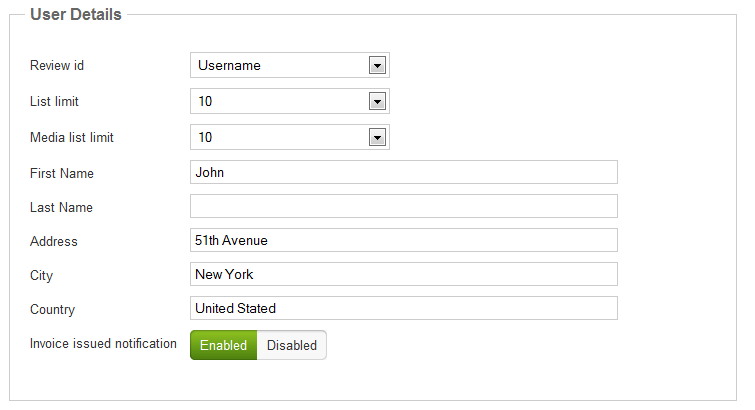 Every user has the option to set a limit for the number of items to be displayed on pages by himself by selecting from the drop-down menu. Here you can also add additional information about you like a full address and a full name. Enable Invoice issued notification if you want to receive an email notification when a new invoice has been issued. Below these you have the Author Details. Enter your Paypal email address and if you want to be contacted by other users. Enable Received review notification if you want to be contacted when a new review has been added. Enable Media sale notification if you want to receive an email notification when a media has been sold. On the Media Purchases History section you can check all the purchases made by you and how many uses you have left on the respective items. In case you want further details about an item you can buy the contact and send a message to the seller. To send the message go to Contacts from My Profile and click on the respective item from which you bought the contact. Next, write the message you wish to send and click on the Send message button. From this section of My Profile you can manage your balance and view the history of it. Clicking on Withdraw funds will allow you to receive an amount from the funds that you have earned. The minimum value that you can retrieve is set by an administrator from the backend. Convert funds allows you to convert the funds from the default currency which is set by the administrator into credits. Enter the amount and below you should see how many credits you will receive for it, click on the Convert funds button to finish the procedure. From the Payment requests history section you can see your withdrawal requests and their status. From this area you can view some of the settings set from the Edit profile as well as your media items and contacts. The number showed in the red part means how many unchecked items you have in the respective section. Media Stats is the place where you can view all the media items you have added to sell and their stats. By clicking on any of them it will redirect you to the respective item's sale page. 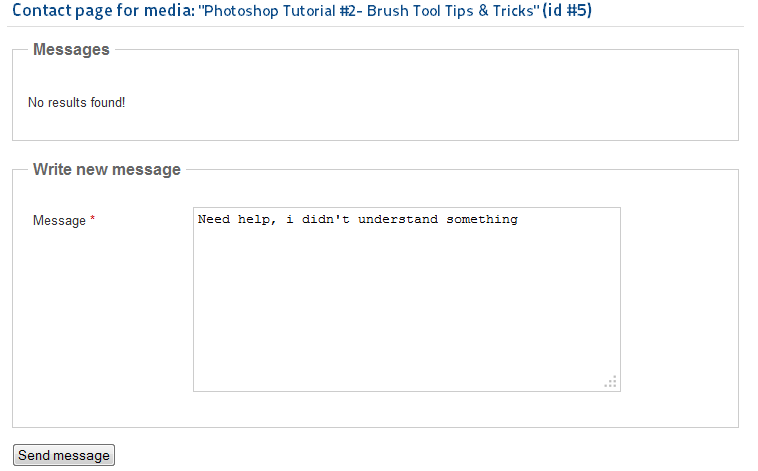 Next to the name of the media item you have shortcuts to edit it, check the messages or the media log. 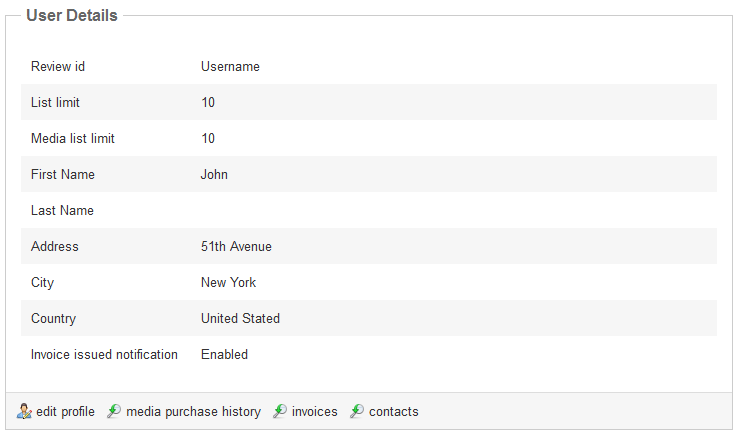 Here you can also check how much you gained for the respective items, number of sales or their status. Contacts will show you a list of the items on which other users bought your contact. By clicking on any of them it will display, if the case, the messages received for the respective item. In case your user can be author you can add new media files, click on Add new media and add a Title for your file. 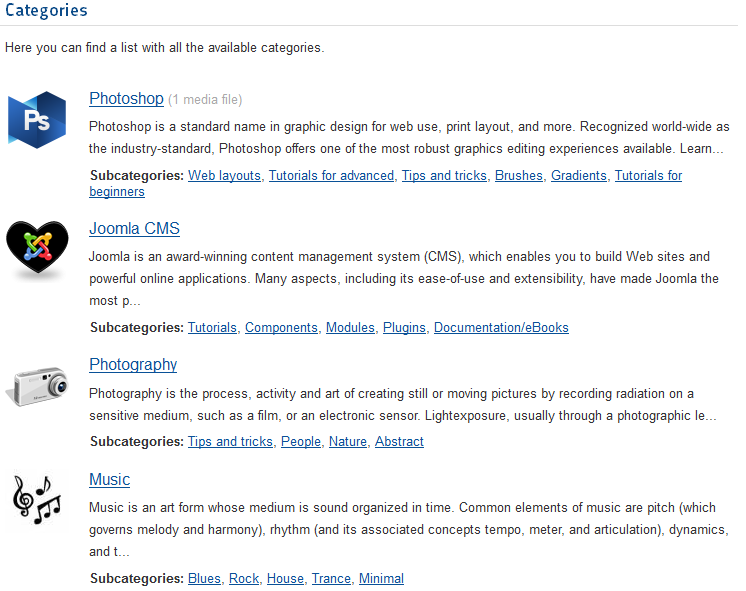 Select the type of the file (image, video, archive or tune) and a category. 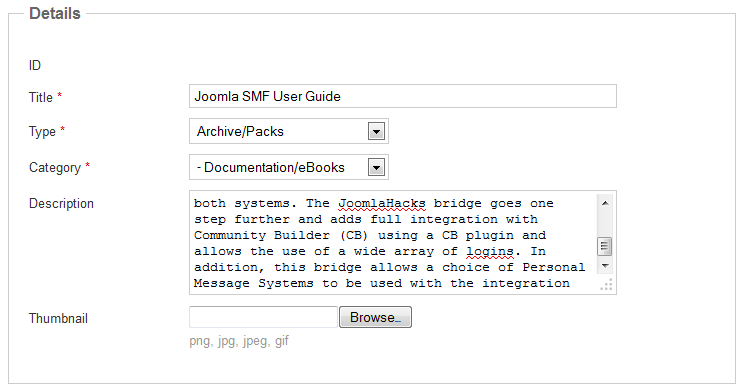 Categories can vary depending on what the administrator has added on the backend. To add some info about your item add a Description and a Thumbnail. Depending on the type of the item you can complete either the Media area, Archive area or both of them. 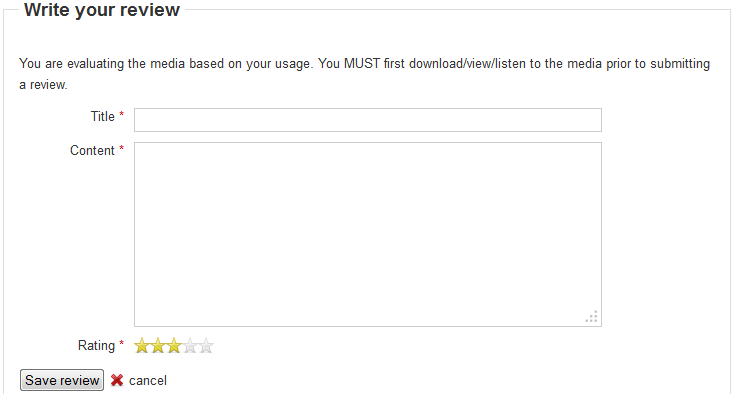 To add which item to upload click on Browse.. and select it from your HDD. Enter the amount of credits the archive file will cost and some details about it if needed. The option to add a price can be disabled from the backend for different types of users and in that case your item will have a default price for the selected media type. To search for a media file you can go to the Categories section and locate the file from the available categories and subcategories. From the Top media section you can browse all the media files. 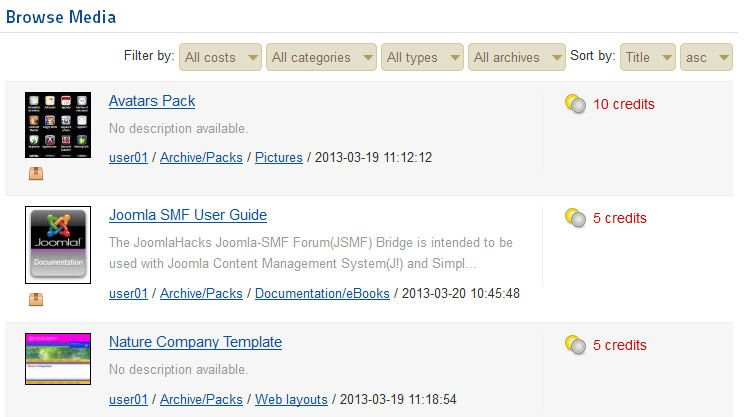 In case you search for a specific file you can filter by cost, category, type or if the items contain archives or not. You can also sort them by title, rating, reviews, or date added. To purchase an item you can click on Purchase download and therefore to download it for a limited number of times. Some authors might only allow you to see the media file a couple of times from the View media area after purchasing, without the option to download the archive. In case you want to send a message to the author click on Purchase contact and then on Contact author. 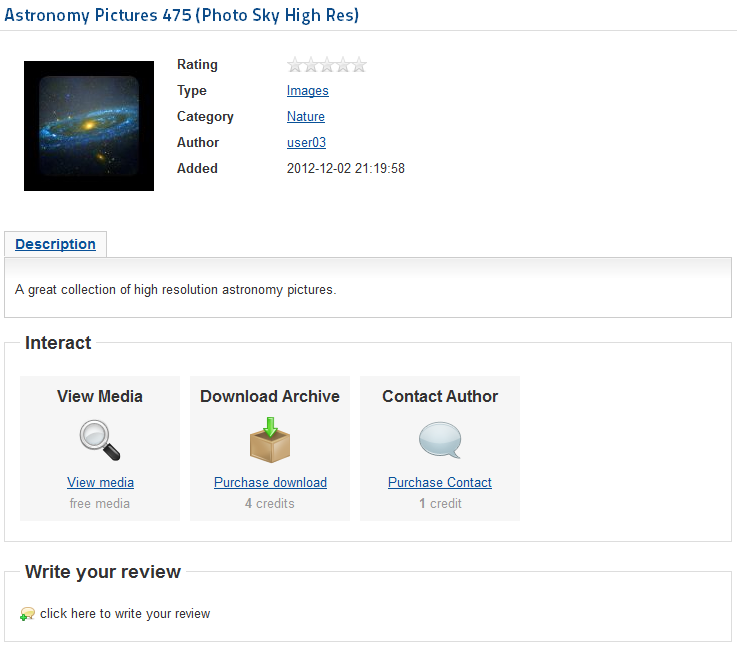 After purchasing and viewing a media file you can write a review and add a rating for it based on your usage.